Modern mine sites are surveyed with a variety of technologies such as LiDAR, GPS and drones. While each of these methods have pros and cons and varying suitability depending on the size and topography of the mine site, many traditional surveying techniques are resource-intensive and can pose a safety risk to on-site surveyors. Creating additional challenges, their accuracy and reliability is not ideal for large areas or hazardous terrain. Although drone surveys, now popular with many mine surveyors, are useful in some circumstances and can usually cover a few square kilometres in a single day, the overall costs are very high when site safety training, drone maintenance and site operations support are included. Unlike other surveying methods, PhotoSat provides an instantaneous snapshot of the entire mine site, with accurate data about pits, stockpiles, tailings, and dumps. With consistent data formatted for a variety of mining engineering software systems, engineering groups can simplify tasks related to data handling and data processing, allowing them to focus on their core tasks. 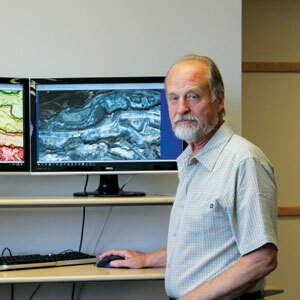 A Registered Professional Geophysicist, Mitchell’s significant experience working at the senior technical level in both mining and hydrocarbon exploration for companies such as BP culminated in the founding of PhotoSat. Using data processing algorithms, methods and software tools applied to the high-resolution satellite photos, PhotoSat creates satellite surveys with elevation accuracy of up to 15cm. Licensed to provide satellite surveying across the globe even in remote locations and those with difficult terrain, sparse vegetation, and hazardous geography, PhotoSat delivers fast, easy access to rich mine site data that helps mine operators make operational assessments, which can, for example, lead to decisions to enhance the lifespan of the tailing ponds and therefore, the mine itself. The company streamlines mine site management with its survey data and makes even volume change measurement monitoring of open pit mines safe and efficient. In addition to the mining industry, PhotoSat has become a force multiplier for oil and gas, oil sands, engineering, environment, and government projects. The company has delivered over 700 satellite surveying projects since 2007, carrying out accuracy studies on the majority of them. One of its clients, Canada’s largest oil mining company, wanted PhotoSat to survey their mine with one-meter accuracy. Despite facing issues related to the rainy season and the formation of puddles all over the site, PhotoSat was able to provide them with 15cm accuracy. With the rise in inexpensive and massive data volumes, PhotoSat strides ahead, offering unmatched accuracy and reliability for large mine sites. Considering the resurgence in mining exploration funding across the globe, PhotoSat aims to develop products for mining exploration, particularly in mapping precious metals such as gold, silver, and copper. “We are continuously building new products and offering services that our clients will require in the near future with the changing business environment,” concludes Mitchell.